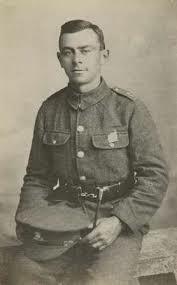 He enlisted in Cardiff into the 2/7th Battalion, Lancashire Fusiliers which formed part of the 197th Brigade, 66th Division. The Battalion landed at Le Havre on 28th February, 1917 and the Division had moved north of Ypres. He was killed in action aged 21 in April 1917. Narberth Museum holds the many letters he wrote home and those written by friends after his death. His final letter, was featured on commemorative stamps in 2007.